On Monday, a class from the Iowa State University Office of Precollegiate Programs for Talented and Gifted (OPPTAG) visited Special Collections and University Archives (SCUA). The course was titled “Cook Your Way Through U.S. History.” In the SCUA classroom, I demonstrated how to find SCUA materials on their topic (cookbooks) and reviewed procedures and handling guidelines in our reading room. Amy Bishop, Rare Books and Manuscripts Archivist, reviewed different cookbooks from Rare Books and recipes from our Manuscript Collections & University Archives and provided students with context on the collections and books. The students then came into our reading room and looked for historic recipes they plan to cook this week. You should come into our reading room too and check out our cool cookbooks! We’re open Monday-Friday from 10-4! You can also check out some selected cookbooks online in the Library’s Digital Collections. Thus did an 1881 newspaper capture the hazards eighteen-year-old Kate Shelley faced as she crossed the Des Moines River on a trestle bridge to warn the Moingona, Iowa, depot of a washed-out bridge further down the tracks. Des Moines River bridge crossed by Kate Shelley in 1881. University Photograph Collection RS 4/8/L, box 373. If you grew up in Iowa, you probably heard the story of railroad heroine Kate Shelley in elementary school. I did not grow up here, so I was excited to hear this nineteenth century teenager’s story and learn that we have her papers here in Special Collections (MS 684). It was the night of July 6, 1881. A strong storm was blowing through central Iowa where Shelley lived on her family’s farm on Honey Creek near Moingona in Boone County. Heavy flooding of the creek had weakened the railroad bridge crossing it near the homestead. A pusher engine, used to push trains up steep inclines, had been sent to check the tracks for damage. While crossing Honey Creek, the bridge collapsed, sending the engine and its four-man crew plunging into the creek. Two men died, and two men were left stranded in the creek. Top photo shows the depot at Moingona in 1876. The bottom photo may be the pusher engine that crashed into Honey Creek. University Photo Collection, RS 4/8/L, Box 373. Shelley was at home when she and her mother heard the collapse of the bridge and the men’s cries for help. A regular express train, she knew, was scheduled to come through later that night, passing through Moingona, then over the Des Moines River and on to the collapsed bridge over Honey Creek. Against her mother’s protests, she decided she had to get to Moingona to warn the station. She first made her way down to the collapsed bridge and called down to one of the crewmembers, saying that she would get help. She then followed the train tracks to the Des Moines River bridge. After the harrowing crossing, she did successfully reach the depot and gave the warning of the collapsed bridge. A rescue party was sent out to save the two men in the creek, Shelley once again leading the way to find a safe crossing to reach the men. Stirring accounts of Shelley’s heroic deed, such as the one quoted from above, were printed in newspapers across the country, and she became a household name. She received many letters from admirers, especially from other young women, requesting photographs, information, and correspondence from this suddenly famous teenager. 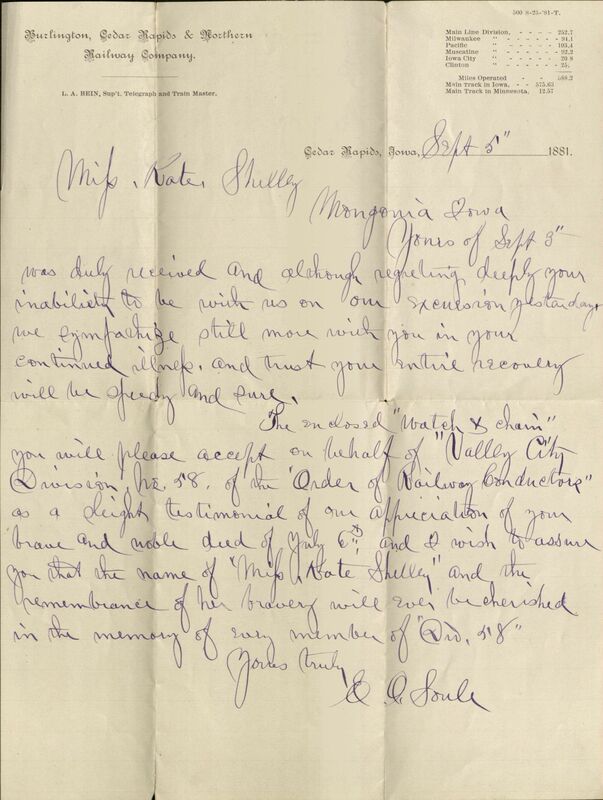 The Burlington, Cedar Rapids & Northern Railway Company was, of course, indebted to Shelley for the deed, for which they presented her with a watch and chain. 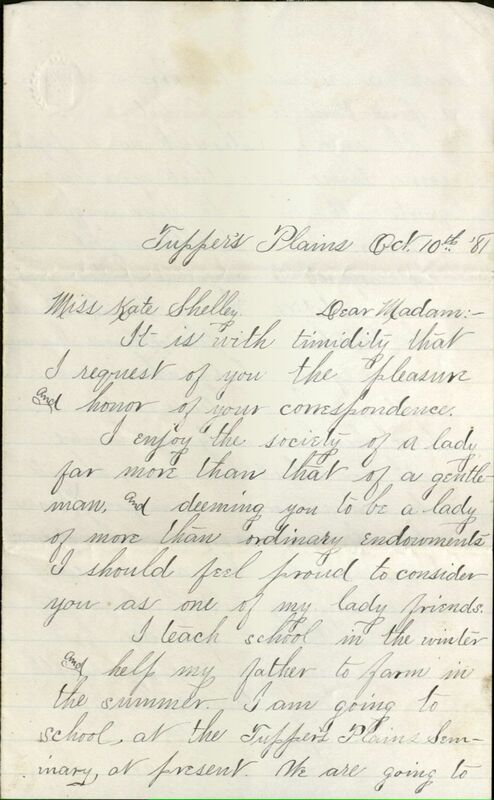 Our collection includes this letter from E. O. Soule, Train Master in Cedar Rapids, Iowa. In 1901, the bridge that Shelley crossed was replaced by a new iron bridge, named the Kate Shelley High Bridge. Here is a picture below. Kate Shelley High Bridge, built 1900-1901. University Photograph Collection, RS 4/8/L, Box 380. The Boone County Historical Society runs the Kate Shelley Memorial Park and Railroad Museum, marking the site of the original Moingona depot. 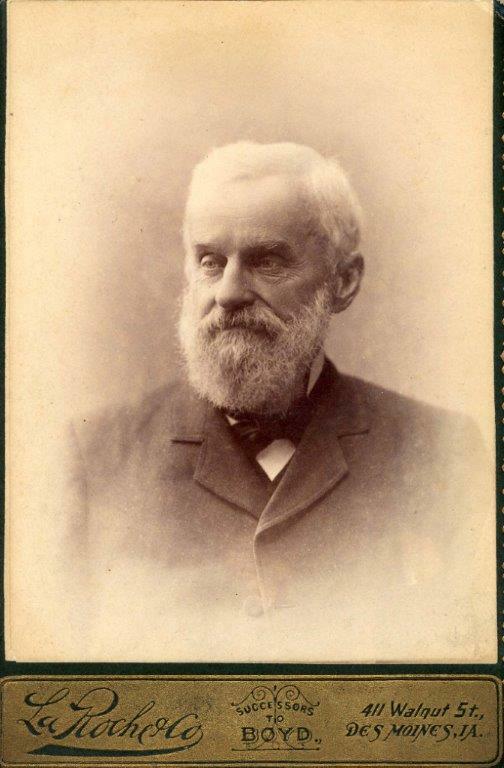 In honor of President’s Day, let’s take a look at Iowa State University’s first president, Adonijah Welch. Welch held the post from 1869 until 1883. In addition to presidential duties, he taught classes at Iowa State (at the time known as Iowa Agricultural College) until his death in 1889. Not only was he a significant figure in the design of the campus, he also helped develop the college’s first agricultural and mechanical arts classes and was a supporter of the right for women to a have a college education. For more information on Welch, check out his digital collection or come in and see the physical collection. The photo above and a photo of his wife, Mary Welch, can be found on our Flickr page. Also, be sure to check out our past blog posts involving Welch, like this and this. Have you ever wondered what classes were like in Iowa State University’s early days? The Charles N. Dietz Papers, RS 21/7/58, can enlighten you. As the first student to enroll at what was then known as Iowa Agricultural College, Dietz took many notes during classes, several notebooks of which he left behind and are now stored in the University Archives. In 1872, Dietz became part of Iowa State’s first graduating class and graduated with a Bachelor of Science degree at the age of 19. After college, Dietz moved to Chicago to work for a lumber business. Due to the panic of 1873 and the subsequent layoffs of some high salaried personnel, Dietz quickly became one of the lumber company’s chief executives. After eight years in Chicago, he moved with his wife Nettie Woodford Dietz to Omaha to go into the lumber business for himself, starting the C. N. Dietz Lumber Company. Soon a wealthy man, he went on to establish the Sheridan Coal Company in Sheridan, Wyoming, which he owned until 1903. The coal mining town of Dietz, Wyoming was named after him. In 1890, the Dietzes built a home in Omaha, where they entertained such notables as Theodore Roosevelt, William Howard Taft, and Helen Keller. Aside from entertaining, in their spare time the couple traveled the world, meeting other notables including future Egyptian president Mahmud Fuad, Herbert Hoover, and J. P. Morgan. 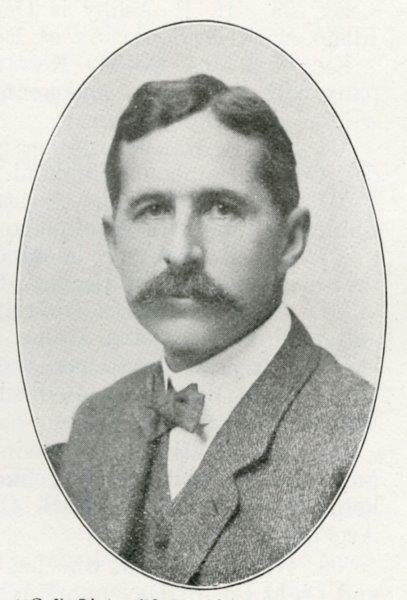 Dietz was also quite involved with the Omaha Public Library and served on the library board for many years, later becoming president of the board. After a decline in health, Dietz passed away on June 18, 1933. 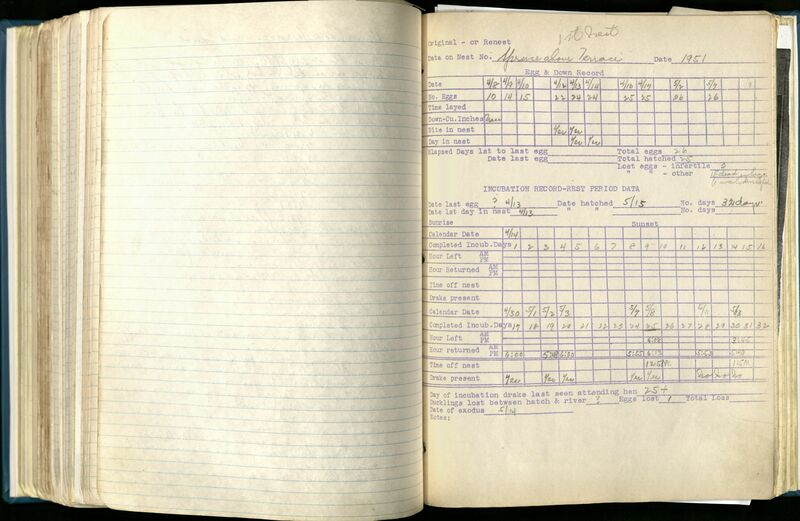 The Charles N. Dietz collection contains a folder of biographical materials and five notebooks from the classes previously mentioned. For more information, take a look at our finding aid and stop in to view the collection! As it’s only one document box, it will take a relatively short amount of time to look through. If you’d like to find out more about Iowa State student life through the years, we have many collections of alumni papers that you are more than welcome to explore. Come on in and see us! Old Main, one of the first buildings on the Iowa State campus (However, from 1858-1898 Iowa State University was called the State Agricultural College and Model Farm). Histories of the building can be found here and here. In addition to our archival collections, rare books, photographs, and films, the Special Collections Department also holds thousands of artifacts, many of which document the history of Iowa State. This spring spring semester, senior anthropology major Jennifer Lambert conducted her senior research project on the hammer our department holds which was used to help build Main Hall, and was used for other building and maintenance work at Iowa State for many years during its early history. Old Main, after the Farm House and cattle barns (now gone), was one of the first buildings on the Iowa State campus and was used for a wide variety of purposes. Jennifer generously gave us permission to use parts of her paper for a blog post. Sections from Jennifer’s paper, Hammering Out Local History: Material Culture Studies at Iowa State University, are included below. [Please note: the photographs, and accompanying captions, were added for the blog post]. Campus circa 1875. The enormous size of Old Main (and the amount of work it must have been to build!) can be better imagined from this early image of the Iowa State campus. Old Main is the large building to the far right. Look at those small houses to the left in comparison! A fire destroyed the north wing and devasted other parts of the building on December 8th, 1900, and two years later the south wing was burned by fire (completely destroying the building). Main Hall no longer remains, and is now known as Old Main. “…Many people moved to Ames to work on the first Old Main construction project and some brought their own tools with them, such as hammers. One of these workmen, Oliphant P. Stuckslager, is tied to not only to the history of one hammer and Iowa State University, but to the history of the United States, as well. Lambert concludes that Stuckslager’s hammer is a claw hammer, made sometime after 1840: “…Claw hammers have two styles depending on their weight: a 13oz-24oz hammer is used for carpentry purposes, and a 24oz-28oz hammer is used by framers to chop, split, and pry apart structural wood. The Stuckslager hammer weighs in at 18.7oz and can be placed in the claw hammer category that is used for carpentry work. Hickory is used in hammer handles because it is a natural vibration dampener, but is prone to break if the user overstrikes and hits the handle on the wood instead of the head. Observations of the Stuckslager hammer and comparisons with other hickory handled hammers shows it to most likely be made from hickory, and that it also has damage to the wood surrounding the head’s base from overstriking. Hammer heads are forged from steel for strength and durability, often heat-treated for toughness and wear resistance. This treatment focuses on the striking face, the eye where the handle is inserted and on the claws. Looking at the Stuckslager hammer, the striking face and claws are a different color and texture from the rest of the head, but this could also be from wear and not heat-treatment. A ground striking face that is canted slightly toward the handle to center hammer blows and a double-beveled nail slot are two other indicators of a carpenter’s claw hammer. Both of these indicators can be observed on the Stuckslager hammer as well. Thanks to Jennifer Lambert for letting us share parts of her informative paper. We wish her all the best as a graduate of Iowa State University!